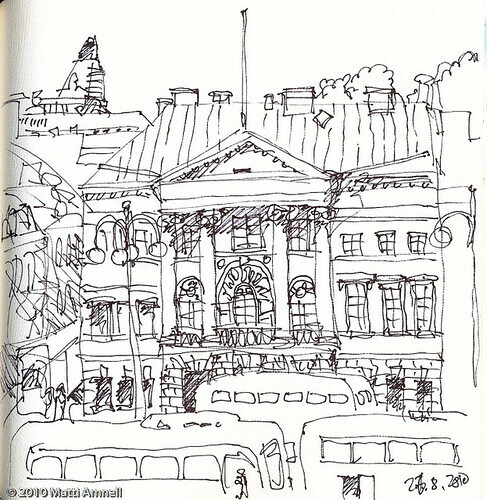 Sketchbook Helsinki, August 26, 2010_2, originally uploaded by Brin d’Acier. I kept being interrupted by heavy downpours that almost washed away this drawing. I opened my umbrella and switched to water-proof markers. Most of the buildings on the square were designed by Carl Ludvig Engel, all in the neoclassical style. 4) A mixed bag of commerce: Shops, a bank, a café that also shows art movies (one of my favourites, but now closed for renovation). The mayor’s residence is squeezed a bit on the side, and there used to be a police station, but they got bumped. – And The Czar in the middle of the square. Yes, it’s a huge ferryboat behind the building. It’s bigger than the buildings in the old town. They cross the Baltic between Helsinki and Stockholm daily. 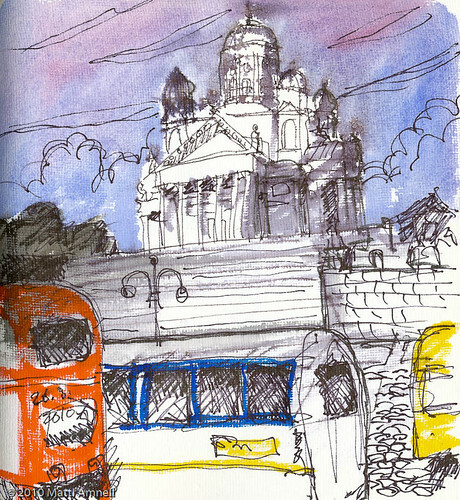 This entry was posted in Sketch of the day, Sketchbook and tagged architecture, city, finland, helsinki, ink, watercolour. Bookmark the permalink.